The week was very wet overall and earlier there was a cold east wind. Today it was quite bright until late afternoon when it started to rain again. The sun hardly touches the ground in the back garden at this time of year, but it was bright enough for six photos so here we go for another Six on Saturday. 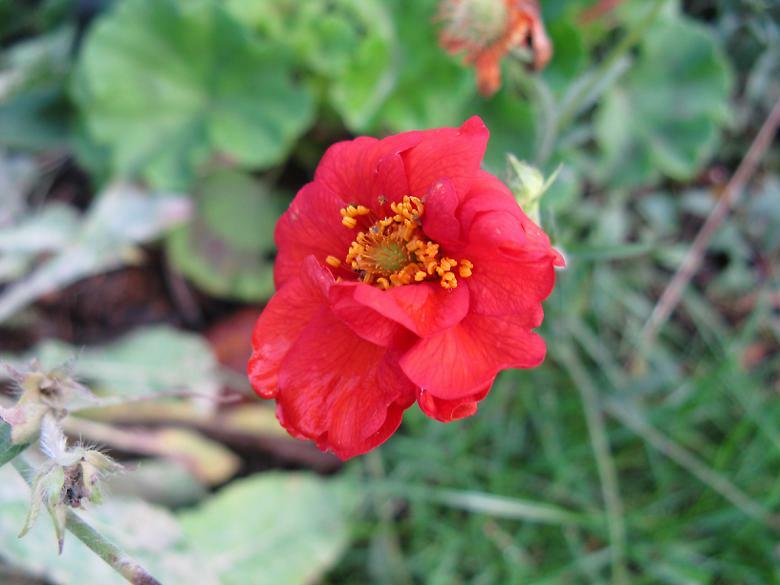 After the long flowering period of G. 'Totally tangerine' last year, I added a few more Geums to the garden this year. However, this year flowering was restricted to spring and early summer. Except for this one, which has flowered continuously. This grew after I dug up part of the left border. 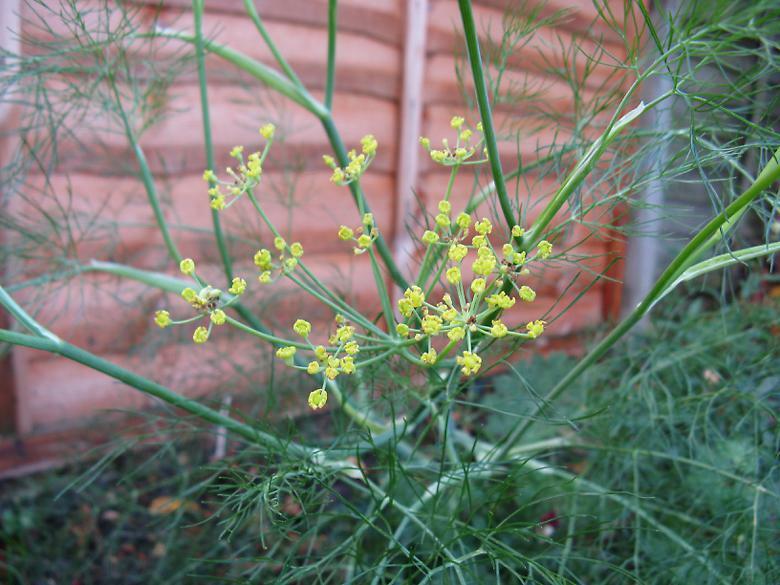 I've read every article on the internet on how tell the difference between dill and fennel and I still don't know which it is. I'm going for Dill, but I could very well be wrong. This was a cutting which was only planted here at the end of August and look at it now. It grows very fast, especially at the end of the season when you expect most things to be slowing down. 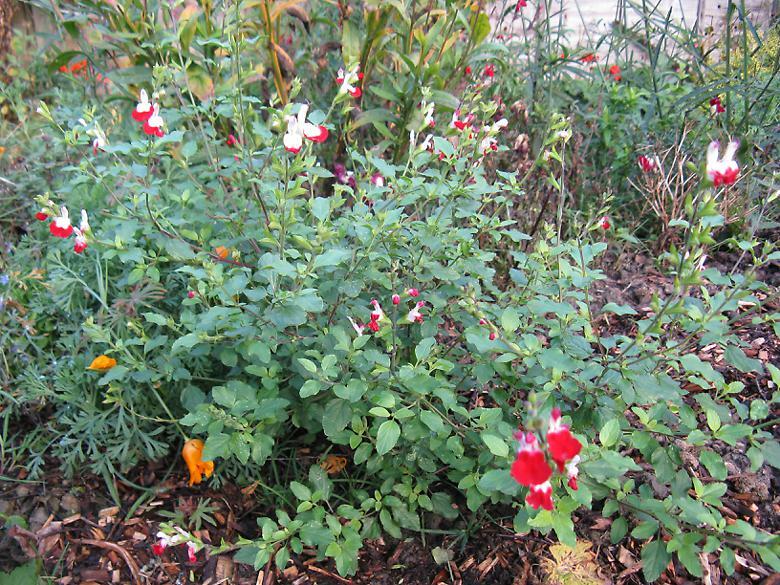 I've been impressed with the shrubby Salvias and I am going to look at getting another one for next year, perhaps a blue or pink one. This page Hardy Salvias for Northern gardens has an interesting list of ones that ought to be hardy for me. 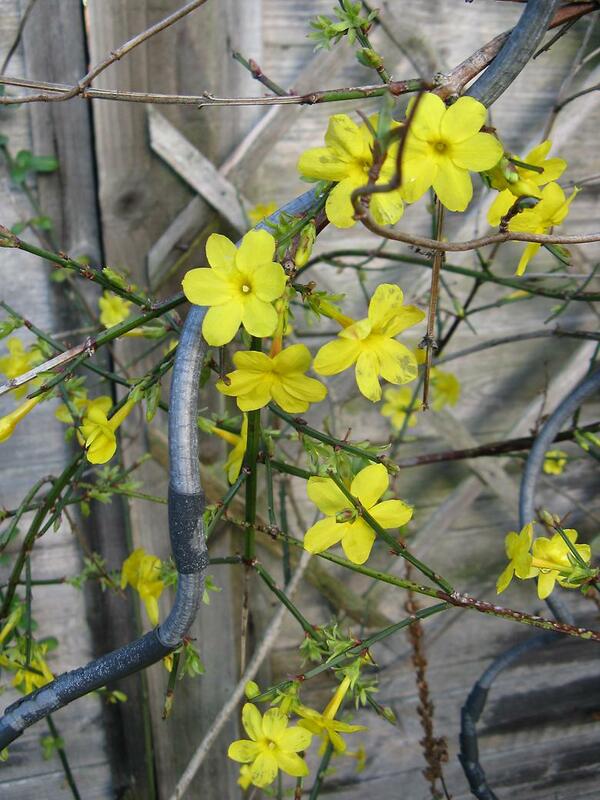 The winter jasmine (Jasminum nudiflorum) hasn't been growing particularly well and may need to be cut back hard. This is a newish piece that I have mostly trained around the existing tripod and it is flowering reasonably well. I probably wouldn't bother with it if it was summer flowering, but it is welcome at this time of the year. I have two pink Sidalceas and they are both flowering. They are suppsed to be different ones but I can't tell the difference between them. 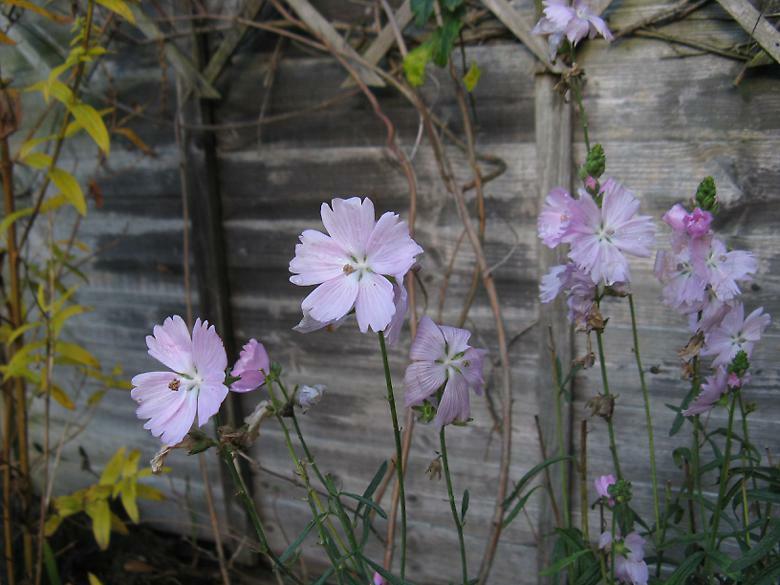 This is still flowering away, even as the leaves die back a little. It has been flowering for a very long time. 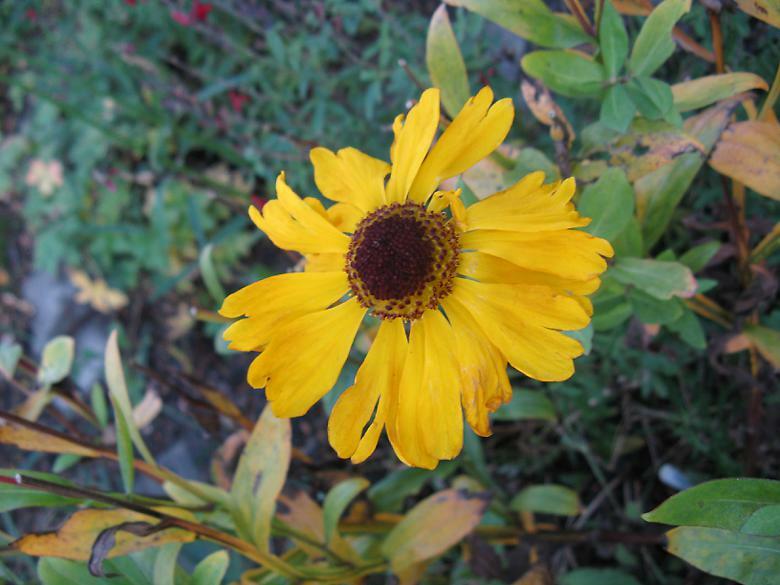 My other Heleniums have now finished flowering. To see more six part slices of gardens around the world, visit The propagator blog.